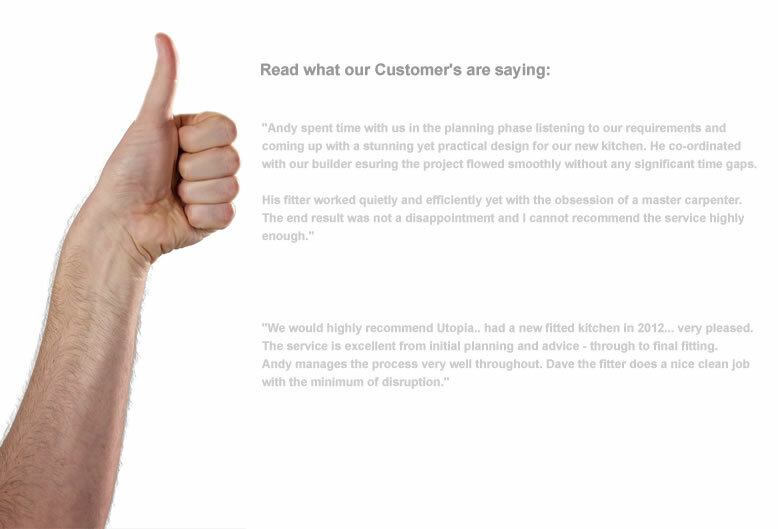 Read what our customers are saying about Utopia Designs. Below are a few testimonials from satisfied customers. We deeply care about our customers and the quality of our work. "Just to say a big Thank you to you and the Team for giving us a fantastic new kitchen. From start to finish it was hassle free and completed on time. Price was extremely good and we would no hesitate to recommend you to anyone." Dawn and Graham. We would love to hear from you and be given the chance to show you how we can create the Kitchen, Bathroom or Home Cinema Room of your dreams. We offer a Free, no Obligation Home visit. Get in touch today!